Congratulations to our second Facebook Fan Trivia Contest Winner, Matt Needham. Need ham has won two free tickets to a local concert. 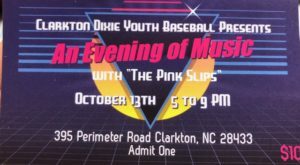 Currently, Clarkton Dixie Youth Baseball is still on go for hosting an evening of music as one of their annual fundraisers on Saturday, October 13th, from 5-9 p.m. at the Clarkton DYB Complex. Gates will open at 4 p.m.
Clarkton Dixie Youth Baseball has been around for years thanks to the founders Buddy Burney, Carlos Lyda, GC Dennis and Jack Heustess. A local group called The Pink Slips will be performing a variety of beach music, oldies and pop music. The band consists mostly of ex-members of the award winning Blackwater Rhythm & Blues Band. Members of “The Pink Slips” include Townsend Link Of Elizabethtown on vocals, Greg Elkins of Clarkton on vocals and trumpet, Billy Little of Clarkton on vocals and saxophone, Dave Williford of Bladenboro on guitar, Billy Prease of Whiteville on drums, Bridger Warlick of Clarkton on trombone, Howard Faircloth of Tar Heel on vocals and keyboards and Neil Singletary of Clarkton on bass guitar. Tickets are being pre-sold at $10 each or $15 a couple. 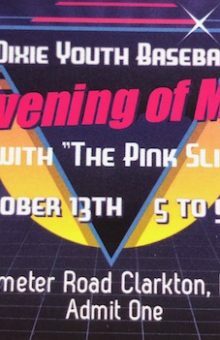 Tickets can be purchased from any Clarkton Dixie Youth Baseball member. At the gate tickets will be $10 per person on October 13th. However you have a chance to win free tickets this week and next week if you are a Fan of BladenOnline.com‘s Facebook page. 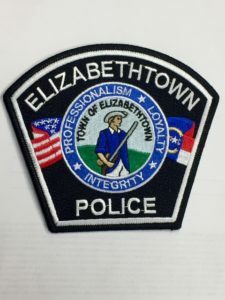 BladenOnline.com will post a video on our Facebook page with a trivia question. We will do a drawing from the Facebook fans who answer the trivia questions correctly. The winner of the drawings will win two free tickets to the Clarkton Dixie Youth Baseball Concert. The first Facebook Fan Winner was Polly Smith. Mr. Needham was our second winner. We have two more tickets to give away. Clarkton Dixie Youth Baseball Players have had four players who have gone on to play professional baseball. The four players who have gone on to have professional baseball careers, according to Frankie Burney are Keith McKoy in the late 1980s, Tyrell Godwin, Toebius Smith and Sincere Smith. There are plenty of fun facts in the article to help make you a winner. Please like our Facebook page and answer the trivia question to be entered in our drawing for free tickets. The Clarkton Dixie Youth Baseball complex is located at 395 Perimeter Lane, Clarkton. Concert gates will open at 4 p.m. on October 13th.